The lorry driver involved in a fatal crash with a bus carrying a junior hockey team has pleaded guilty. Sixteen people died and 13 others were injured. Many of the victims were between the ages of 16 and 21. Jaskirat Singh Sidhu pleaded guilty on Tuesday to all 29 charges of dangerous driving, causing death and bodily harm. On 6 April, the lorry he was driving collided with the Humboldt Broncos team bus on a rural road in the province of Saskatchewan. "Mr Sidhu advised me, 'I don't want to make things any worse'," his lawyer Mark Brayford said outside the courthouse after his client pleaded guilty. "He's overwhelmed by the expressions of sympathy and kindness that some of the families and players have expressed to him, in spite of the fact that their grief is entirely his fault." Mr Sidhu will be sentenced on 28 January. His employer is also facing safety-related charges. 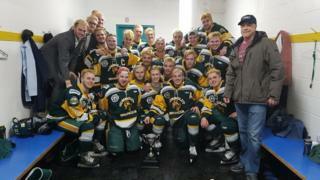 The tragedy shook the small community of Humboldt, where the team was based. But it also touched the whole country. A GoFundMe fundraiser for the victims of the crash raised a record-breaking C$15m ($12m; £8.5m) in under two weeks.